One 14 karat white gold cluster ring. One old European cut diamond (1.16 carats: SI1 clarity: H-I colour). Two old mine cut diamonds (1.97 carats: I1-I2 clarity: I-J colour). 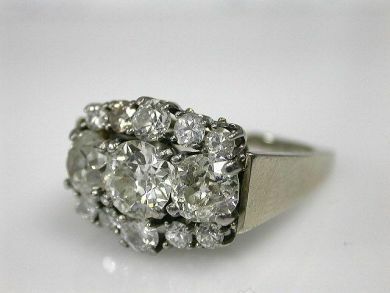 Ten old European cut diamonds (1.20 carats: SI calrity: I-J-K colour).